Anticipate is a maintenance mode plugin that allows you to serve your visitors an alternate “coming soon” page while you work on building your website in the background. Once activated, all of your visitors will be sent to the Anticipate landing page. When logged in as a WordPress Admin, however, your normal theme appears, allowing you to build your website seamlessly in the background. Anticipate comes with an easy to use options page that allows to you configure the plugins in minutes. 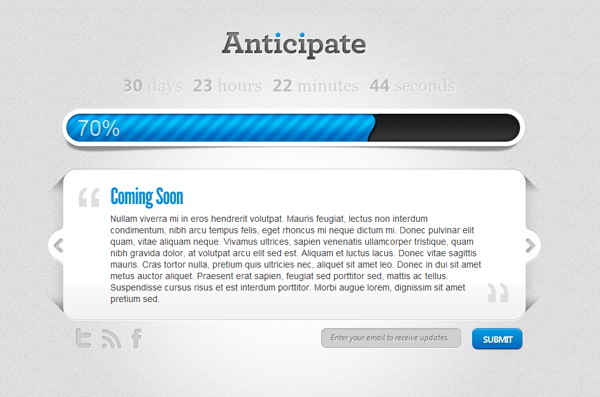 Anticipate comes with an animated countdown and progress bar, helping you to build hype about your upcoming release before its even ready. The plugins includes an email subscribe form that allows interested visitors to add their email address to an interest list. These emails are stored in the database, and can be exported from within the options page. Social networking icons are added to the coming soon page, allowing you to increase your online presence and gain a following before your website even launches. The slider allows you to add a few short blurbs to the page to tell your visitors what you are all about.